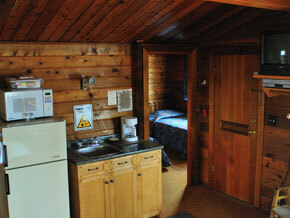 Cabin #8 is the fifth in our meal plan cabin. This cabin is a cedar pan abode. 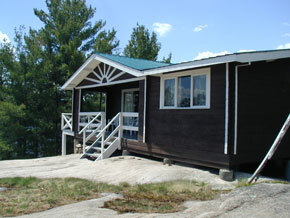 Located to the left of the main lodge this cabin is road access and can be walked to from the lodge approximately 5 minute walk. The closest building to it is cabin 7 which is app 400' on the right and cabin 9 which is 1000' on the left hand side. 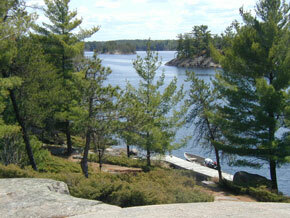 This cabin is located on the same large peninsula as cabin 6, 8 and 9 and sits high on the rock. It has a rock formed staircase down to the water's edge with its own private dock able to accommodate up to 3 private or rental boats. The unit is extremely clean and has the following amenities. In a nice size living room you will find a wooden living room couch, love seat and chair, 21" color television with DVD player, table and chairs/benches with kitchenette, apartment size refrigerator/freezer, microwave, coffee maker and toaster. 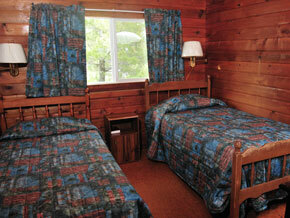 In the cabin you will find 4 bedrooms with 2 single beds per room with linens and pillows small nigh table with reading light. A 4pce bathroom with bath/shower, vanity and low flush toilet. The covered porch with deck on the side has a propane gas grill and chairs with outdoor fire pit for those evening camp fires. It has a great view looking out onto West Bay.